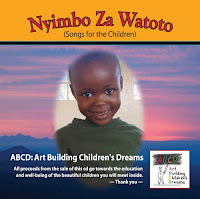 ABCD: Art Building Children’s Dreams now has a CD of wonderful original music with which we can raise more funds for the children. It’s called NYIMBO ZA WATOTO (Songs for the Children). The coordination of the massive effort to do this work was done by a good friend of mine, Graham Fife, a music lover and generous soul. Musicians/songwriters were found who graciously agreed to donate a song or two. Colin Macdonald, (Colin Macdonald Design) another good friend (and my oldest former student!) came on board to do the great artwork and design. Mastering of the CD was done by Sam Reid of Slip One Digital. He’s a member of Glass Tiger. It’s an exciting eclectic mix of styles of music ranging from ballads, to klesmer/reggae, to indie vocals, to hot latin beats, to electronic instrumental rhythms, to African folk sung by children. Inside the case is a wonderful booklet which contains all the lyrics of the songs, photos of all the children and a thumbnail photo of an artwork by each of them. The booklet itself is a treasure! We are launching the CD at Arts and Hearts for the Children of Kilimanjaro, our fundraising dinner and silent auction, on Oct. 23.If you’re reading this and would like a copy just contact us via email. To give you an idea of how the funds can be used: the sale price of $20 pays for school lunches for a child for ONE YEAR!